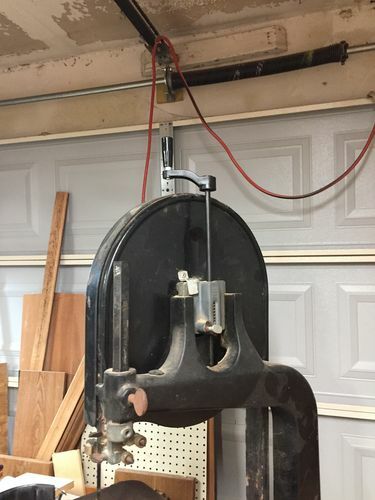 For years I’ve had an old Delta 14” bandsaw with the standard equipment (barring the recent addition of a linked belt), and I’ve got it fair tuned up, but wouldn’t use it a lot, and was guilty of not necessarily lowering the tension after use. This week I purchased a crank from Amazon and got it installed yesterday. It’s like having a whole new toy! The crank was easy to install, and the action is very smooth. For a view of what I had to deal with previously, bobosaurus (love the name, Bob), acquired a similar saw a while ago, and has some good pictures of the saw with the original tension screw. Why did it take so long to spend the 20 bucks to make my bandsaw easier to use? Let’s put it down to “not the brightest candle in the candelabra” and celebrate the fact that I DID finally get it done. Yeah, I installed one from Peachtree and it works great. It’s amazing how quick and easy it is to tension the blade. Yes. Decide what you plan on doing with it before you make a purchase. i.e. If your plan is to add a riser and a 3/4” blade for resawing then buy another saw, otherwise, watch Alex Snodgrass to get it set up. I agree with Andybb in that it’s better to know what you’re planning on doing with it before you just take a leap of faith and buy the first one that comes up. I knew that I wanted a saw able to handle fair-sized pieces (I don’t do huge projects yet, so a 14” with a riser works fine for me). After that, replace the wheel tires with new (unless they’ve JUST been replaced), get familiar with the various guides that keep the blade where you want it to be. If the belt is solid, replace it with a linked belt (one of the BEST investments for tools that use belts). Get a good selection of blades (1/4”, 1/2”, 3/4” will cover most needs). A fence is probably a good thing, but I haven’t got/bulit one yet (thinking about it, though). And the crank. If the saw has a short knobbed screw for setting the tension, spend the $20 bucks to purchase a crank that will be tall enough to go over the wheel. You can thank me later. ;-). After that, it’s just using the tool and becoming more familiar with it. Learning to maintain it, to fine tune it, and appreciate where it lies in your woodworking “toolkit” ( how it can help you with projects, it’s strengths, it’s weaknesses, where you might be fooling yourself if you think the bandsaw can do this, etc.). It was my baby and my POS, and yes repaired, then had to replace the pot metal pivot that the top wheel spins on because it wears out and flexes over 30 years. That s why they sell parts. It did everything thing I needed it to do when it came to cutting curves etc. but setting it up for resawing and ripping accurately was an hours long ordeal and it struggled with a 3/4” blade. The upper wheel tracking hinge is a weak spot on all 14” cast iron bandsaws, not just yours – and trying to run a 3/4” blade on one will put too much stress on it – even more so when using a riser – which results in what you experienced. It s not the machine, it s the design – which is basically identical to the original Delta it s cloned after. Had I known better I would have saved my money and could have gotten a better saw that would do the job for probably less $ than I spent trying to upgrade it, not to mention putting a dollar figure on my frustrations. I struggled with it for 2-3 years then bought a new BS that I love and would sleep with if my wife would let me. I am looking for something in 14” range, and I have no idea what I’m going to end up with except that it won’t be HF stuff. I hope to score a vintage machine one day but won’t say no to a used Delta either. Definitely no plans for buying new, for many reasons; the biggest one is that I just like to give old tools a new lease on life. Restoring old tools turned out to be as satisfying as woodworking for me, if not even more. Yes, agreed. Now that I have a decent BS it does a lot of the stuff that my TS was just too much machine for. Only use the 3/4” for resawing hardwoods. Otherwise I keep the 1/4 inch on the saw. Sometimes use the 1/2” for resawing and ripping softwoods or smaller hardwoods. Don’t have an 1/8” as I’d cut my fingers off trying to make Snodgrass reindeers. From everything I’ve read, the wider the blade, the more accurate and straight the re-saw. Do I know from experience? I do not. As for tricks, I’m constantly amazed at what peole can do with handsaws, chisels, and a cabinet maker’s rasp. Good to see so much information being shared.